Opening in 1999 at the Lyceum Theatre, The Lion King remains one of the longest running musicals on the West End and yet is among the few hits that I have not yet seen. With the memorable music, unique puppetry and vibrant Disney aesthetic, it is easy to understand why this is a sell-out show. So when I was offered tickets, it was without hesitation and with great anticipation that I accepted. What makes this production so unique is the impeccable design by Richard Hudson and Julie Taymor. The scenery and the costumes tie together beautifully to create the African aesthetic, and their vivacity and quirk enhances the Disney style. What’s more, the puppets designed by Julie Taymor and Michael Curry are used in a wonderful way to tell the story. From giant elephants and rhinos down to tiny shadow animals that hop around behind a screen, the puppets make the performance hugely engaging for all ages. The Lion King is the classic Disney tale of two lion brothers, Mufasa and Scar. Mufasa is King of Pride Rock, and in the beginning of the show we see him present his new son and heir, Simba, to the Pridelands. However, evil Uncle Scar is now placed second-in-line to the throne. We discover how far Scar will go to be crowned King, and we watch as Simba becomes an outcast who must decide whether to save Pride Rock. Fun fact: though inspired by the Disney film, it’s actually based on Shakespeare’s Hamlet. George Asprey as Scar was a brilliant villain although somewhat reminded me of the pantomime baddie. His version of ‘Be Prepared’ was particularly menacing. But the stars of this performance were Howard Gossington’s Zazu and Brown Lindiwe Mkhize’s Rafiki, who definitely got the biggest cheers of the night. Both had excellent comic timing which kept the audience on their toes, and Lindiwe Mkhize had a voice that gripped us right from the start in ‘Circle of Life’. The audience were cheering after her first note! 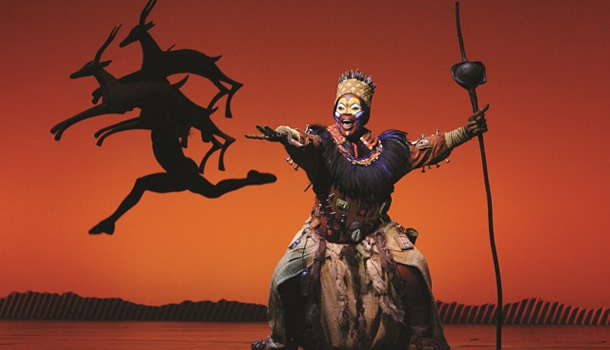 The Lion King has one of the biggest casts in the West End, including an ensemble that despite not always being slick and in time with each other, wowed the audience with their dancing abilities in some imaginative choreography by Garth Fagan. For me, the musical numbers by Elton John and Tim Rice were brilliant. Ava Brennan as Nala gave a beautiful rendition of ‘Shadowland’ that moved me to tears. Richard Frame and Keith Bookman as Timon and Pumbaa were also an audience favourite, particularly for the children who recognised ‘Hakuna Matata’. And whilst the singing was wonderful, a mention has to go to the brilliant orchestra, directed by Daniel Bowling. The Lion King is rare in that it is one of the few shows I have seen that really does have something for everyone. It is family friendly, engaging, beautiful and has musical numbers that will have you dancing in your seat. I would recommend it for anyone who wants to see something completely unique. After all, it’s one of the West End’s longest running shows for a reason!